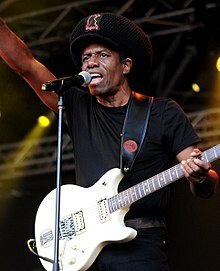 Edmond Montague "Eddy" Grant (born 5 March 1948) is a Guyanese-born British musician. He was a founding member of The Equals, one of the United Kingdom's first racially united music groups. He left the group in 1971. He is also known for a successful solo career that includes the platinum funk single "Electric Avenue" and the reggae song "I Don't Wanna Dance". Grant was born in Plaisance, British Guiana (now Guyana). His younger brother, Rudy, is a reggae musician. In 1960, he moved to London to live with his parents. ↑ Greene, Jo-Ann. "Eddy Grant – Music Biography, Credits and Discography". AllMusic. Retrieved 24 December 2017. Wikimedia Commons has media related to Eddy Grant. This page was last changed on 24 December 2017, at 05:42.